In a small, dark room, dolled up with "windows" overlooking a futuristic urban sprawl, LucasArts dimmed the lights and introduced us, in three parts, to what they consider the future of the Star Wars franchise: Star Wars 1313. What is the significance of these four numbers? Coruscant, the planet-spanning city that serves as the capital of the Galactic Republic (or the Empire, depending on when in the continuity this is placed; LucasArts has yet to say) is as deep as it is broad. In addition to spreading across the planet, it has thousands of levels piled upon each other, a Matryoshka doll of a metropolis. 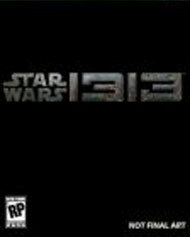 Star Wars 1313 takes place on level 1313 of the planet, reportedly infamous for its less-than-scrupulous inhabitants and dangerous atmosphere. And LucasArts, in general, is aiming for dark and gritty. 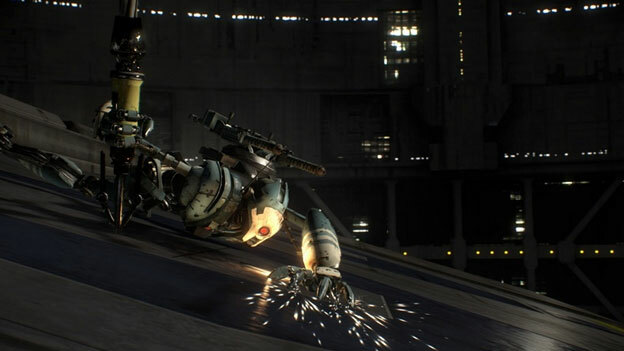 They want 1313 to be a more mature take on the Star Wars franchise, removing such touchy-feely elements as the Force from the story and casting the player as a bounty hunter (a young one, it would appear from the footage, though the staff on hand told us that the character design was not final). The intention is to inundate the player with gadgets and weaponry much like those used by the infamous Boba Fett, giving players options in combat as they pursue their bounties. The combat itself speaks a familiar language to gamers, though it's a new proposition within the Star Wars franchise. 1313 is a third person shooter with a cover system, a la Gears of War. The only weapons actually demonstrated were the basic blaster pistols made famous by Han Solo, but they were capable of what appeared to be a short-range stun burst in addition to the standard lances of lethal energy one would expect. Stepping back, though, the demo begins with the temporary protagonist and his presumed mentor (or, at the very least, an older and more seasoned bounty hunter) boarding what is ostensibly a standard cargo vessel. As they prepare to take off, a box shifts and falls to the floor, bursting open as a vicious, snarling creature attempts to leap out. The older bounty hunter scrambles to shut the case once more as the protagonist beats the creature back with violent thrusts from a long pole. Crisis averted, they begin their descent to Coruscant's level 1313. It isn't long, however, before a sinister ship, captained by what appears to be an imposing droid, closes in on the "heroes." The droid lands upon their ship and, after a brief assault that disorients the bounty hunters, makes off with the beast-housing cargo container. It heads back to its ship via a zipline as enemy forces land within the broken cargo trawler, now cracked open and aflame. It's here that the player gets to take over, ducking behind cargo containers for cover and peeking out to fill enemies with hot, lasery death. As the last foe falls, the seasoned bounty hunter stuffs him into the escape pod and launches him into his own ship, even as both the bounty hunter and protagonist follow the enemy's zip-line across to it. 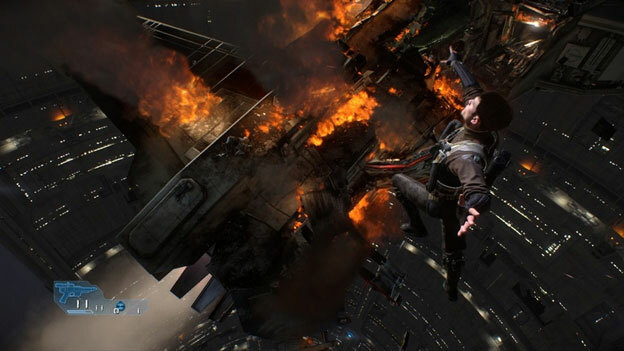 With both ships aflame, careening down the seemingly endless tunnel toward the planet's core (or surface; I'm not an expert on how the city is laid out), the protagonist and his mentor engage in the game's other primary activity: platforming.